A couple’s compartmentalized built-in desk alcoves. With two separate alcoves, each partner in the relationship is assured of having an absolute albeit small domain over which they have complete control. Christopher Alexander conceptualized the idea of an “Away Room” in his 1977 book, A Pattern Language. In it he recommends that people living together also need to have opportunities to be alone, and suggests that each household member should ideally have a space of one’s own. In the best case scenario this should comprise a separate room affording private space, but if that is not practical, he writes, everyone should have at the very least an alcove space away from the business of the household with at least a modicum of enclosure and of privacy. Author Sarah Susana popularized and built upon the same concept in her Not So Big House series of books, encouraging homeowners to create a room in which to escape near the common areas of the home, but offering some privacy from the noise and socializing of the other spaces. The problem: No one can be close to others, without also having frequent opportunities to be alone. The solution: Give each member of the family a room of his own, especially adults. A minimum “room of one’s own” is an alcove with desk, shelves, and curtain. The maximum is a cottage – like a Teenager’s Cottage (Pattern #154), or an Old Age Cottage (Pattern #155). In all cases, especially for adults, place these rooms at the far ends of the intimacy gradient — far from the common rooms. While it’s clearly possible to create a room for each household member, the ideal of each adult having their own private room and each child having their own bedroom is obviously infeasible for the vast majority of American households. This obviously is not the ideal, and generally in fact the farther the alcove is located from primary circulation areas – with their accompanying noise and bustle – the better. All things being equal, if the house is small but sufficient space exists in the master bedroom it may be possible to admit of a built-in desk subdivided into two cubby-like alcoves, one for each partner in the relationship. The master bedroom, being the sanctum sanctorum, is unlikely to be casually invaded by the general family buzz, thus almost guaranteeing privacy and repose. With two separate alcoves, each partner in a relationship is assured of having an absolute albeit small domain over which they have complete control. And finally, they can reach a tacit arrangement to occupy the entire room all to themselves on alternative days or at different times of, say, the same evening if need be, essentially creating a timeshare. All this may seem to be quite an elaborate exercise for many who read this blog, yet the “Away Room” concept does meet a fundamental human need, that for occasional, yet complete, privacy. This entry was posted in Santa Cruz Architect and tagged architectural design, architectural theory, creativity on September 18, 2014 by santacruzarchitect. Daylighting design leverages sunlight to enhance a building’s interior illumination through direct, diffused and reflected lighting approaches. It can be used to complement electrical lighting, create more stimulating environments, and significantly reduce energy costs. Effective use of daylighting can improve one’s mental state, enhance moods, boost focus and mental acuity, lower fatigue, and reduce eyestrain. Other significant benefits have been documented, from hastening healing in healthcare environments to improved student performance in educational environments. This entry was posted in Santa Cruz Architect and tagged architectural design, architectural theory, building energy, building technology, design on August 13, 2014 by santacruzarchitect. Camillo Sitte (1843-1903) was a noted Viennese painter, architect, theorist, and planner. He distinguished himself in the art of city planning culminating in his seminal work City Planning According to Artistic Principles with great influence and authority on the evolution of urban planning and its regulation on the European continent. This work has subsequently gone on to influence generations of urban designers and architects throughout the world. City Planning According to Artistic Principles was an aesthetic criticism of the design of urban spaces as they were being realized at the end of the nineteenth century. While mainly concerned with urban planning, the book has had a deep influence on architecture inasmuch as the two are integrally intertwined disciplines. For Sitte, the most important aspect of civic buildings was not the architectural form of the buildings themselves but rather their how their form, characteristics, and deployment as building blocks contributed to the character and quality of urban spaces. 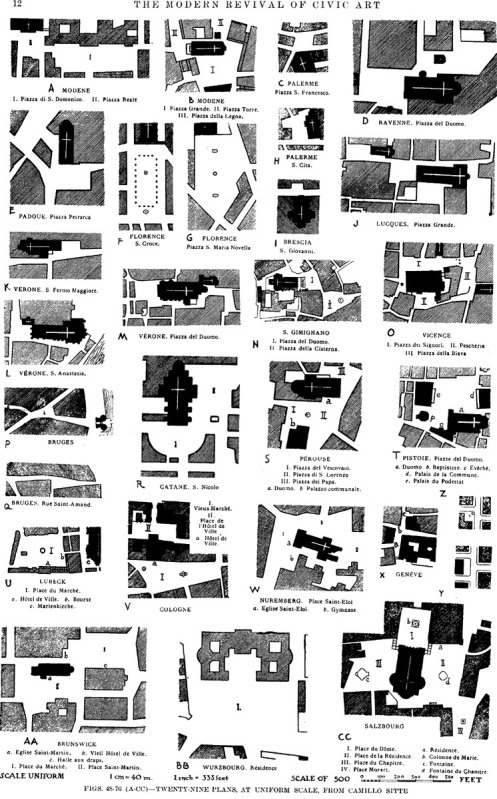 In preparing his work, Sitte travelled extensively to study the spatial structures of then-contemporary city plazas of his own native Vienna, in Paris, Salzburg, Rothenburg on the Tauber, Dresden, and dozens of other European cities, carefully sketching their physical planimetrics, elevations of their significant buildings, and placement of statues, fountains and other monuments within those spaces. He similarly studied their earlier precedents in Athens, Rome, Florence, Venice and Pisa. He applauded the practice in ancient Greece, Rome, and during the Italian Renaissance of deploying buildings of monumental character as the physical walls of those plazas and urban spaces. Imagining what civic life in these urban spaces must have been like in the times of Pericles, Julius Caesar, and Lorenzo the Magnificent, he reflected on how the architects and city planners of those times had designed aesthetically superior spaces reinforcing civic culture. Sitte criticized the trend of contemporary urban planners to isolate the placement of significant civic buildings, churches, and monuments as celebrated objects, confronting them as to how such elements had been presented in former times, not as individual objects but instead as ornaments woven into the tapestry of the urban space. 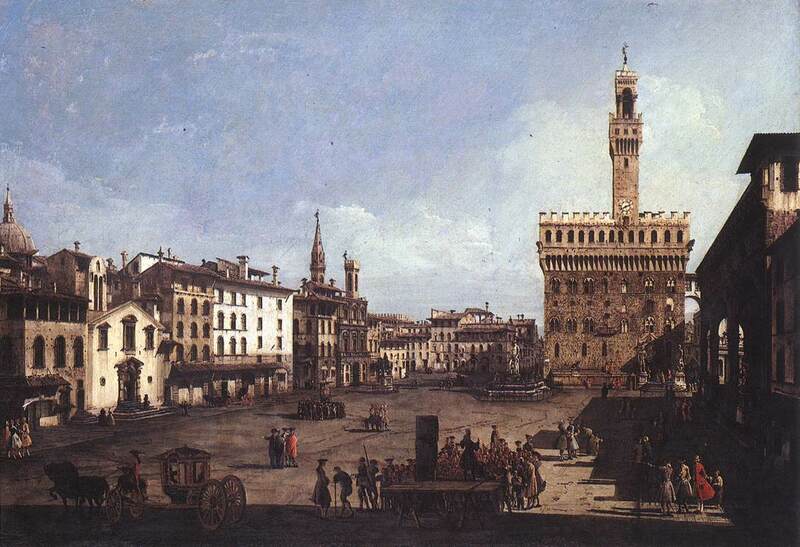 He similarly criticized the regular, obsessive order of contemporary plazas being built by contrasting them to the irregularity of those of the medieval city. More importantly, he identified from a psychological viewpoint the importance of proportion to human scale as critical to the design of effective civic spaces. In so doing he opposed trends among his contemporaries towards broad, over-scaled boulevards, avenues, and squares, enjoining instead that, “a square should be seen as a room: it should form an enclosed space”. 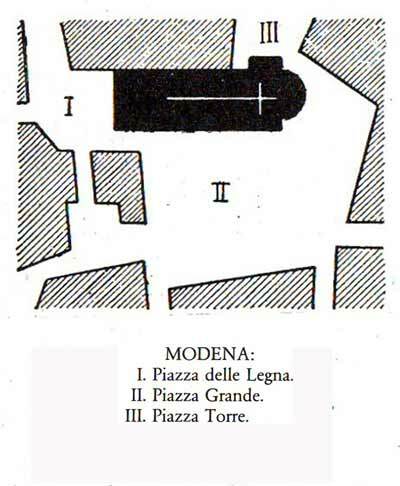 Among his most valuable contributions to urban design theory and practice is his implementation of the figure-ground diagram. His diagrams, carefully drawn to scale, captured planimetrically the formal patterns of the urban spaces he studied. By delineating the solid masses of buildings (“figure”) against the negative space between them (“ground”) he helped popularize an invaluable tool in the analysis of civic spaces. This entry was posted in Santa Cruz Architect and tagged architectural theory, design, Santa Cruz Architect, urban design, urban theory on December 9, 2013 by santacruzarchitect. The Mesoamerican ballgame was an ancient sport with ritual associations played by the pre-Columbian peoples of Ancient Mexico and Central America. It’s origins are thought to date from the 15th century B.C. and, in it’s ancient version, ended with the Spanish conquest in the 16th century A.D. Thus, it endured for some 2700 years. Although some iterations permitted the use of forearms or rackets, in the most common version of the game the players kept the ball in play with their hips, buttocks, and knees. The ball was made of the rubberized latex sap of the lowland Castilla elastica tree, ranged from 10-12 inches in diameter, and typically weighed 3 to 6 lbs. The game is thought to have been involved with geophysical activities including the movement of the sun, and rituals including the death and descent of the sun into the underworld, the recycling of crops, of vegetation, of seasons and of thus the regeneration of life itself. The ritual significance of the game is reflected in the expenditure of effort made in the building of ball courts, many in ceremonial precincts, and in the artwork devoted to the game. The Lords of Day and Night play ball against each other on an I-shaped ballcourt divided into four quarters (Codex Colombino: PL: 11). In The Mesoamerican Ballgame (University of Arizona Press) contributors Linda Schele and David Freidel describe the ballgame as “a central focus of power and mystery to the pre-Columbian Lowland Maya. More than a game, it was a passionate play with intent to move the cycles of the natural and social worlds across the dangerous thresholds of oblivion”. The ballgame was played within a large structure built of blocks of native limestone. In plan, the structure generally can be described as a long, narrow alleyway: this was thus the playing field upon which the game, itself a ritual, was enacted. 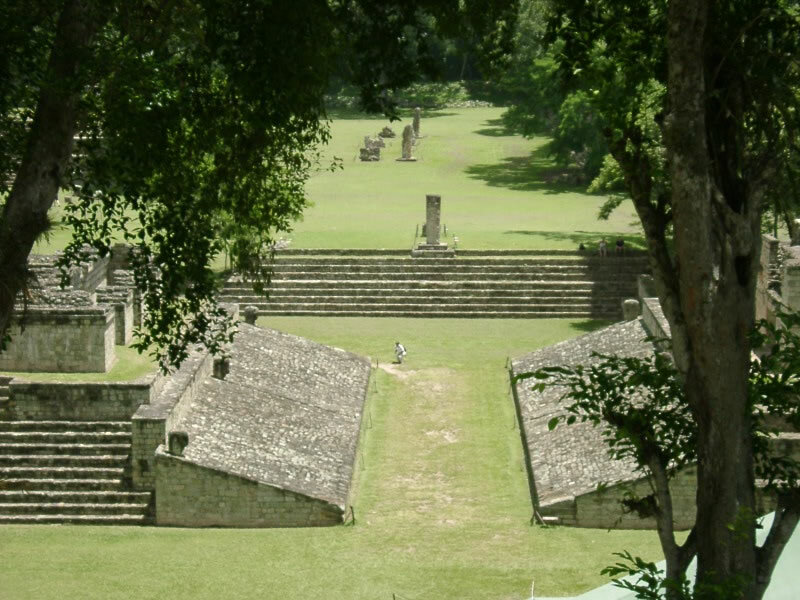 The Great Ballcourt at Chitzen Itza. In early iterations this alleyway was apparently open-ended, without terminating walls. In later versions, the long axis was terminated with end-walls and side-courts, resulting in an “I”-shaped configuration in which the long axis of the playing field is terminated by two cross-axis spaces. In general all of the later ball courts apparently have this same “I”-shaped plan form. Ballcourt at Coba, the Yucatan, Mexico. In section, the playing alley was flanked by limestone block walls with both horizontal and sloping (or, more rarely, vertical) surfaces. Although the finishes are no longer extant these walls were originally lime plastered and apparently brightly painted, al fresco. Figures carved intaglio covered these walls, commemorating ritual victories and losses, and usually the ritual decapitation of the winning captain to fertilize the soil. 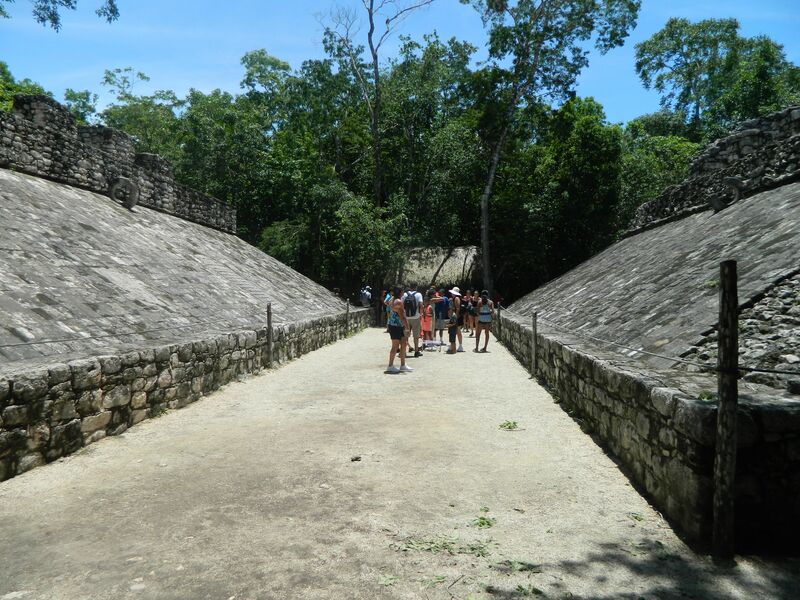 Ball courts were built by the Toltec, Olmec, Zapotec, Maya, and Aztec civilizations, and archeological sites have been found from northern Mexico to Belize, Guatemala, El Salvador, Honduras, Nicaragua, and northern Costa Rica. 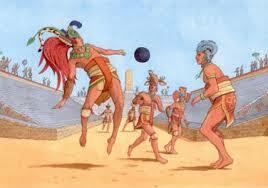 There are an estimated 1,300 known ballcourts in MesoAmerica, with a geographic extent of over a million square miles. This entry was posted in Santa Cruz Architect and tagged architectural photography, architectural theory, art history on November 17, 2013 by santacruzarchitect. They Built Their Own Demise: Lime Mortar, Render, and Plaster: What Role in the Decline of Classical Mayan Civilization? Chitzen Itza, west facade of the temple called “El Castillo” constructed c. 600AD. Constructed of hewn limestone blocks and whitewashed in lime plaster, the original plaster render has not survived the centuries. A flat shelf made from the structures of ancient animals, the Yucatan was uplifted from the seabed around 10 million years ago. With its emergence from the seabed, plants arrived. 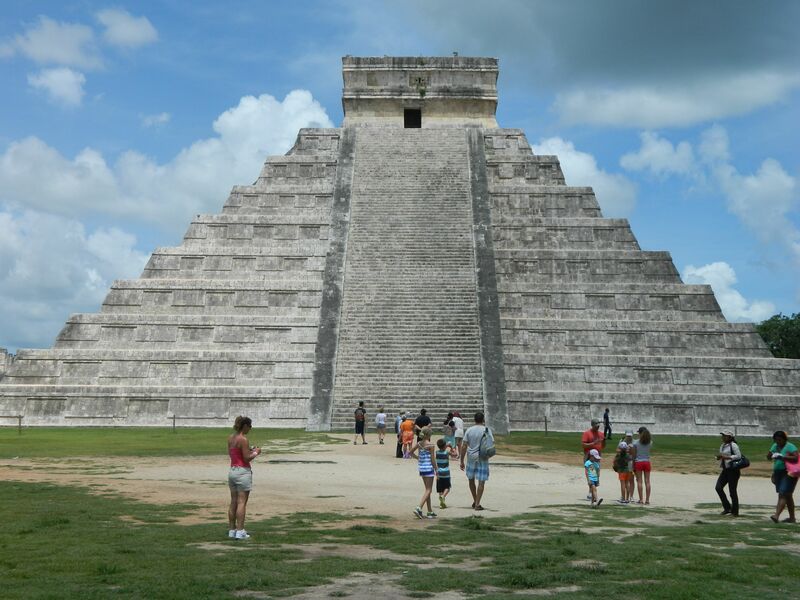 Around 2500BC it is believed that the people destined to become the Maya arrived on the peninsula. Through many generations, the Maya became the builders of cities. 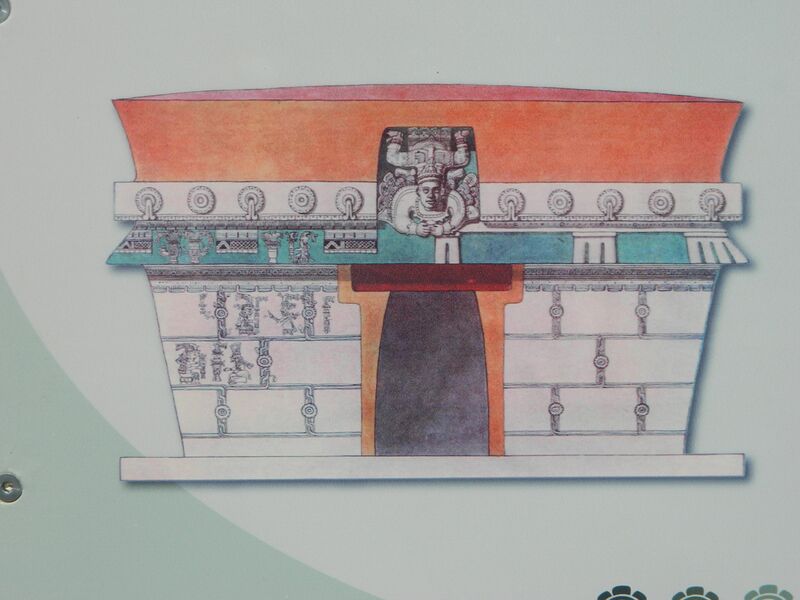 Each city-state of the Maya was centered at its core upon the focal buildings, the edifices signifying the status of the city, the focal point of rulership, and the city’s relationship to the gods. 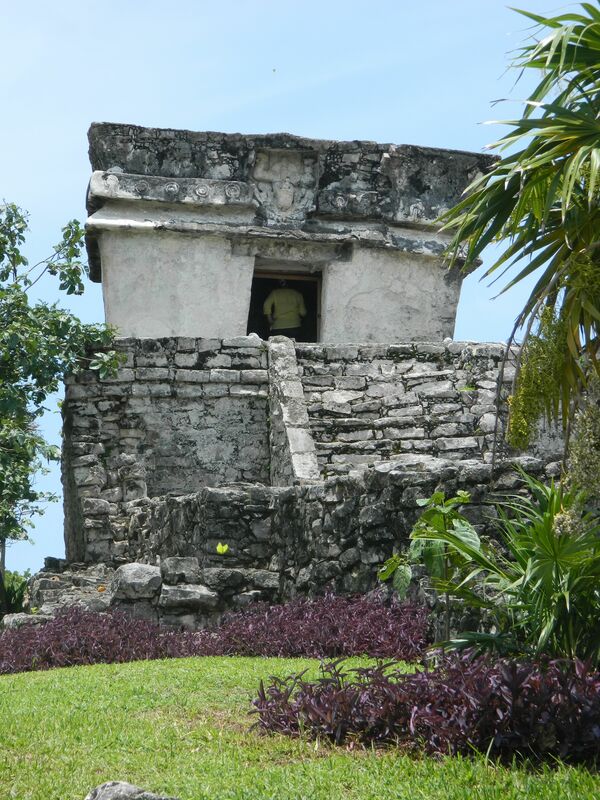 In the Mayan city the focal buildings generally included temples, observatories, and ballcourts. The temples served as the structures dedicated to communication with the divine, the observatories were dedicated to communication with natural cycles, and the ballcourts were associated, among other roles, with resolving internecine rivalries between city-states. Rendering, west facade, Temple of the Descending God at Tulum depicting the painted lime plaster render typical of Mayan edifices. Each city-state had its own quarry from which the massive blocks of limestone, buildingblocks for the edifices, were hewn. More significantly, every important edifice was apparently whitewashed, as it were, with a keen layer of lime plaster and then painted in vibrant colors. Once fitted together and assembled, the building’s presentation relied on lime plaster to achieve the desired effect. The very laying up of the blocks themselves depended on lime mortar to hold them in place. Thus the architecture of the Maya depended on limestone and lime plaster for their very viability. The conversion of limestone into either mortar or plaster relies on availability of the raw material (limestone), a ready source of fresh water, and heat. In the Yucatan the stone was readily available, and freshwater also readily available from the cenotes, the underground chambers of the Yucatan where water naturally collects. But for heat, the Maya could only rely upon the burning of forests, and the resulting deforestation is thought by many to be perhaps the ultimate reason for the collapse of Mayan civilization. West facade, Temple of the Descending God at Tulum. Photograph by the author, July 9th, 2013. The Maya harvested the forests around their cities to produce the heat sources necessary to the conversion of raw limestone into the mortar and plaster needed for their building projects. For plaster render, it is estimated that many square miles of deforestation were required to produce each square foot of rendered plastered surface area. Multiply these estimates by the many thousands of building structures erected by the Maya and one can see that the baseline impacts of Mayan architecture upon the ecology could not have been slight. Add to this impacts resulting from internecine rivalries between rival city-states, and one can perceive what may have been a tipping point in the ecology of the Maya. 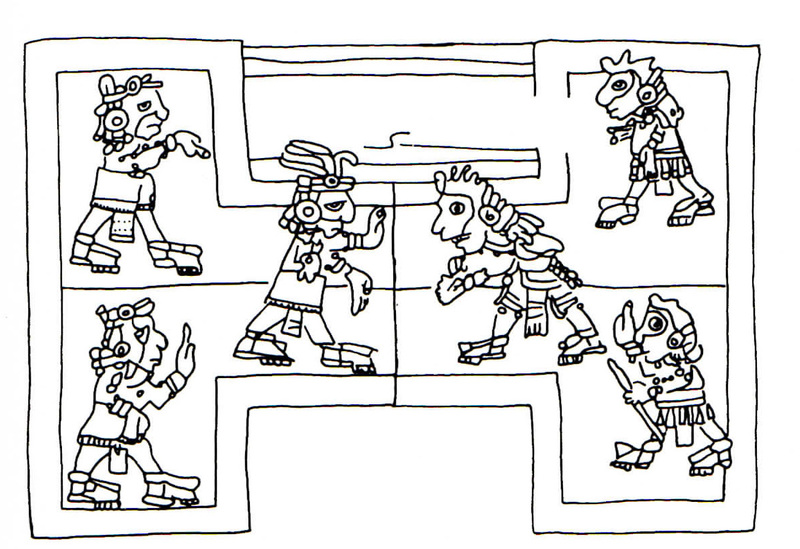 Competition between the Mayan city-states is well known. For example, the 60 mile causeway from Coba in the south to it’s sister-city Yaxuna in the north is understood to have been constructed for purposes of military defense of Yaxuna, ally of Coba, against the aggressions of city-state of Chitza-Itza and it’s allies. 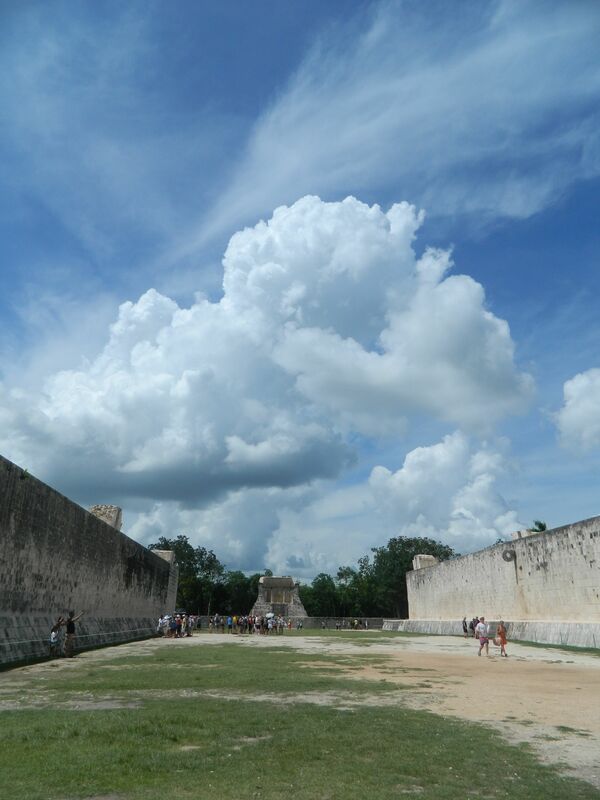 Each Mayan city itself could be seen as the focal point for competitive interaction between rival states. As each city-state grew and naturally sought to aggrandize its own interests, other city-states sought to aggrandize theirs. Objectifying the legitimacy of the city-state required the construction of monuments, and the construction of monuments demanded resources: the quarrying of stone, harvesting of water, the deforestation of trees. Thus, even as trees were burned to fuel the construction programs necessary to the city-state – the edifices, monuments, the roads – upon whose efforts the citizens were focused, the resources themselves were stretched beyond their carrying capacity. As the forests became overharvested, competition for the resources essential to the Mayan city-state grew commensurately, even as the carrying capacity of the land was diminished. At the time of the invasion of the Spanish Conquistadores according to most accounts the Mayan cities were apparently by and large mostly abandoned. Tulum, on the east coast, remained among the viable Mayan cities, most others having been abandoned by the time of the arrival of the Spaniards. Environmental degradation leading to war in turn fomenting increased competition for natural resources is not, of course, the only theory available to explain what became of the Mayan city-state – other theories abound. Having said that, the amount of environmental degradation necessary to the construction of the architecture of the Mayan city is quantifiable. What have not been quantified are the internecine and political factors which fed into their architecture, and consequent demand for resources which may have led to their demise. This entry was posted in Santa Cruz Architect and tagged architectural theory, ecology, environment, sustainable building practice on October 28, 2013 by santacruzarchitect. The design process has been called the most misunderstood part of being an architect. It requires passion and a dedication almost approaching love to arrive at an excellent design, yet the creative process must almost always be done within a definitive timeline and for a finite professional fee. Certainly, as design professionals we have tools and techniques that lend structure to this process – the criteria matrix, typology matrices, and the like. Yet the design process, the creative act, is not so straightforward as that. It is, in point of fact, far from linear: more often than not the architect must venture resolutely into realms of spaghetti-like mazes where divergent thoughts, tasks, and activities thrive. To do it “right” means taking in all the client’s myriad programmatic needs, physical and emotional, their nascent raw concepts, ideas, goals and desires, and capturing them by some rational means into precise drawings describing, in meticulous detail, the intent and means of constructing a physical object embodying those needs. For any design problem there are infinite solutions, some better than others, and all having varying degrees of merit: to sift through them all could consume any designer’s lifetime. Given infinite possibilities, the design process is thus by it’s very nature an intangible search for meaning. Yet the client’s design budget and production schedule are both very concrete and very tangible. It’s perhaps for this very reason that the practical constraint known as the “deadline” was invented. L’Amic: What is your definition of design? Eames: A plan for arranging elements in such a way as to best accomplish a particular purpose. L’Amic: What are the boundaries of design? Eames: What are the boundaries of problems? L’Amic: Does the creation of design admit constraint? Eames: Design depends largely on constraints. Eames: The sum of all constraints. Here is one of the few effective keys to the design problem: the ability of the designer to recognize as many of the constraints as possible (and) his willingness and enthusiasm for working within these constraints—the constraints of price, size, strength, balance, surface, time: each problem has its own peculiar list. Charles Eames’ conceptual diagram of the design process, displayed at the 1969 exhibition “What Is Design” at the Musée des Arts décoratifs in Paris. In Eames’ diagram attending the exhibit we can see his mapping of the interests of the design office, the client, and those of the public. The diagram communicates that it is within the overlap where all three interests meet that the designer can work with conviction and enthusiasm (read passion). 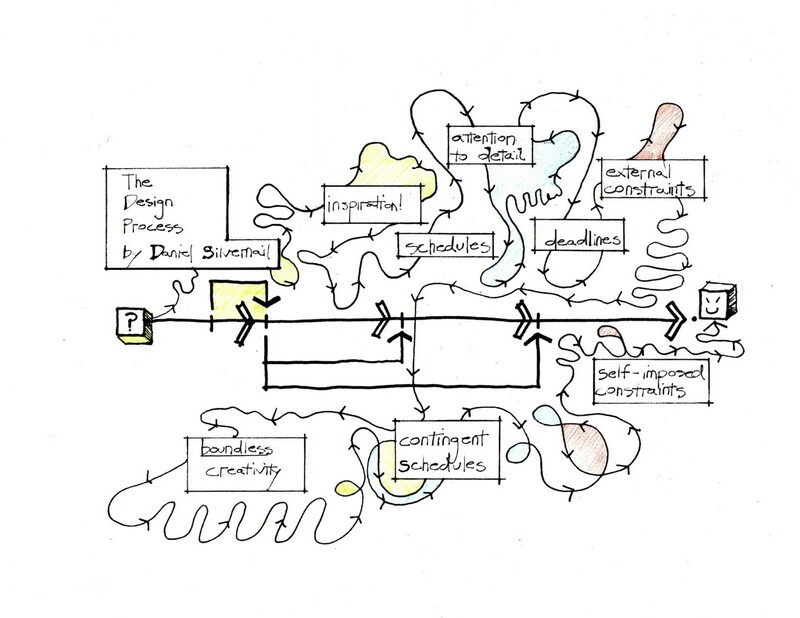 His diagram also conveys that the design process is by its very nature an inherently “messy” business. Eames’ diagram is in it’s own unselfconscious way quite deliberately “wiggly”, mapping rational concepts to the wandering lines of an oft-times irrational process. We architects do not generally like to show off the squiggly lines, fits-and-starts, design cul-de-sacs, whole design schemes tossed out towards the furtherance of the production schedule. Perhaps we should always do so, for same is at the very core of the process, despite (or perhaps better, because of ) the necessary reality of production budgets and deadlines. These are among the constraints Eames capably articulates in his diagram. 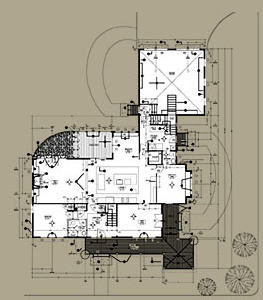 Every successful design, each successful work is infused with the design architect’s personal and unique approach to the design process, his recognition of the complexities and contradictions of the process, and his disciplined conviction and sincere passion in support of the realization of the design. For the successful architect every design is an amalgam infused, by design, with the mystique of alchemy. This entry was posted in Santa Cruz Architect and tagged architectural design, architectural expression, architectural theory, creativity, design, design process, Santa Cruz Architect on September 2, 2013 by santacruzarchitect. In an age of prefab homes, remodels and additions, the built environment is constantly changing. Rarely does a building’s original structure endure these changes, resulting in waste and consumption of materials and energy. The few structures that do withstand demolition, however, tend to be historically and culturally significant. In being so, a building’s capacity to sustain these stressors is reflective of valuable design. The “one size fits all” design aesthetic that emerged in the global age “tend(s) to overwhelm (and ignore) natural and cultural diversity, resulting in less variety” and a loss in cultural significance (McDonough 2002: 33). Thoughtless design perpetuates sprawl, uniformity and meaningless development. Without authenticity, or an intention for cultural development, the built environment looses its importance in the community. With the environmental context, the materials used, renewable energy sourced and level of LEED certification obtained traditionally measure a building’s sustainability. Although there is great importance in these aspects of green building, the element of design is considerably overlooked. Beyond aesthetics, design is seldom considered a factor of sustainability. Original design, reflective of the community it was built for, establishes an intergenerational significance. Culturally significant buildings that are representative of the community, inevitably survive longer by being restored and reused. In contrast, insignificant design perpetuates uniformity and eventual demolition- enabling the cycle of waste and consumption. Authenticity is essential in determining a building’s value, duration of occupancy, lifespan and sustainability. This longevity aids in the creation of culture, and lasts across generations. Failure to construct a building that is representative of its culture, will impact its ability to survive, resulting in demolition, abandonment, and reconstruction. Thus, thoughtful, original design is the ultimate factor in determining a building’s sustainability- its capacity for durability and reuse. This entry was posted in Santa Cruz Architect and tagged architectural theory, design, design theory, green building design, net zero energy, urban design on June 7, 2013 by santacruzarchitect.